There are no sales or any other sort of commercial business done here. This site is just for fun. Enjoy! 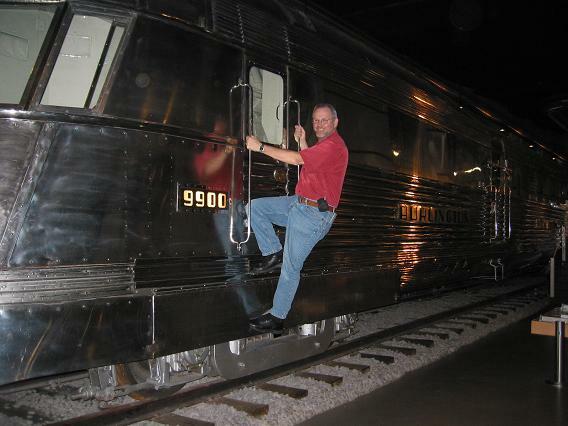 This photo was taken during a visit in 2006 to the Chicago Museum of Science and Industry. The Pioneer Zephyr number 9900 has recently been refurbished and installed in its own display hall. That's Bill trespassing on the exhibit. Click on the photo to see a PDF file from The American Society of Mechanical Engineers. 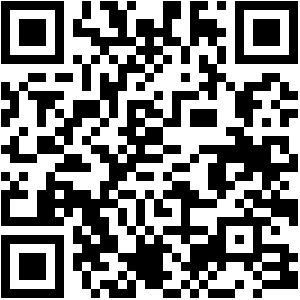 Handy scan code to visit this site on mobile devices. Did you find something you were seeking or that you enjoyed? Let me know. The moon spins like the earth but, instead of one revolution per day, a revolution takes 27 days, 7 hrs., 43 min., 11.6 sec. As the moon phase is about 29-1/2 days and, the average month takes about 30-14 days, you can see how eventually there will be two full moons in one and the same month. The second full moon, in the same calendar month, is called a 'blue moon'. As days go by, and a person is not paying attention to the moon, you can easily tell if the moon is going to be full or, if it was full by remembering the famous words "what's up DOC". Think of the O as a full moon then, note the curve in the D and C. When the curve is the D, it is going to be full. When the curve is like the C, it is going away from being full. Exeligmos is described as 54 yrs. 1 mo. for a solar eclipse to come back to the same spot. Samos is described as 18 yrs. 10 days. Three Samos equal one Exelgmos. In addition to the names commonly used in the USA, there are some additional names used by the earlier tribes and nations. Please visit the site in this link to see an impressive list of names from those peoples who were here before the Europeans came. 2018-11-19 Added the image of a card I use to help keep the bus wires straight. 2018-08-23 Added some pictures of the control panel wiring on the old N-Scale ZOT. 2017-06-28 Added 4 photos from the old N-Scale ZOT: Thunderbirds and a Container Crane. 2017-05-25 Added a link to a page of essays on a variety of model railroad topics. 2017-03-14 Added a link to a page of American Indian names for the Full moons. 2017-03-14 On the ZOT backdrop page, added a link to Clouds Technique and some photos showing the thickness of some of the elements. 2017-02-19 Added a second link to Dave Farguhar's blog. This one is for repair of Marx reverse units. 2016-12-06 Added a link to Brittney's history site. Also fixed a few broken links. 2014-08-31 Updated the TCAMG Photo Album Index - Version 12. 2014-04-17 Updated the new ZOT Power and Wiring page. 2014-05-07 Updated the page for Marx items to avoid when kit bashing. 2014-01-22 Added a link to Dales Smith's American Flyer Displays. 2014-01-22 Added a page with examples of some of the critters made in various scales. 2014-01-16 Added a page for the All Aboard Fastrackers modular system. 2014-01-15 Added links to the All Aboard Fastrackers Modules and some videos. 2014-01-10 Added a page with information on H K Porter Diesel locos - prototype and model. 2013-12-21 Added a link to the Binns Road site for O-Gauge reference - especially older tinplate. 2013-11-12 Added a photo taken on a friend's layout. 2013-10-17 Added a link to a page about Marx HO Trains. - Very Handy. 2013-10-15 Added a link to a page about the Transcontinental Railroad.